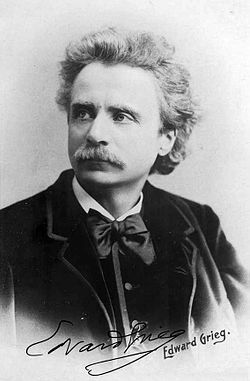 Norway’s most famous composer, Edvard Grieg, was being celebrated on the 175th anniversary of his birth Friday with a marathon program on Norwegian Broadcasting (NRK) due to run into the weekend. A large collection of his unpublished letters were also being released as the country hailed the man who helped put Norwegian music on the map. NRK was playing everything Grieg ever wrote, on both its TV channel NRK2 and radio channel NRK Klassisk. The broadcast began at 5:30pm Friday, with more than 600 musicians taking turns playing in Bergen’s concert hall (aptly named Grieghallen), at Grieg’s former home in Bergen that’s open to the public and known as Troldhaugen, and in NRK’s main large studio (Store studio) at Marienlyst in Oslo. The continuous broadcast ran until late Saturday night, June 16. Both NRK’s Store studio in Oslo and Troldhaugen in Bergen were staying open to the public during the entire special arrangement as well. NRK dubbed the program “Norway’s soundtrack.” It’s the first time that all of Grieg’s musical production was being performed in the course of a marathon concert. Musicians include several of Norway’s best, with pianist Leif Ove Andsnes and violinist Henning Kraggerud among those playing at Troldhaugen. Andsnes was also among those taking the initiative for the 175th anniversary celebration of Grieg. He and Kraggerud were set to play Grieg’s Opus 8: Fiolinsonate nr. 1 i F.dur. It was Grieg’s first sonata and dates from 1865, written while Grieg was on a holiday trip to Rungsted outside Copenhagen. Other highlights include Håvard Gimse playing Grieg’s famed Opus 16: Klaverkonsert i a-moll, which is 150 years old this year. It’s often been described as the world’s most well-known piano concerto, and Gimse will perform it at 9:51pm Friday at Bergen’s Grieghallen along with the Bergen Philharmonic Orchestra. Early risers could hear, at 6:22am Saturday, Grieg’s nationally romantic favourite Allegretto tranquillo e grazioso, better known in Norway as Norske Dans nr 2 and best known as the theme song for one of NRK’s classic Friday evening programs, Norge Rundt, which has charmed Norwegian audiences for years with its light, offbeat features from around the country often featuring spectacular scenery. The song can also grate on people’s nerves when ice cream trucks drive around in Norway, trying to attract ice cream buyers with their tinny-sounding version of the piece. The entire program for NRK’s Grieg marathon can be found here (external link to the Grieg Museum’s website, in Norwegian). Publishing firm Vigmostad & Bjørke, meanwhile, is also celebrating Grieg by releasing a book entitled Fra motgang to seier: Edvard Grieg i årene 1877-1885 (From adversity to victory: Edvard Grieg in the years 1877-1885). It presents 50 previously unpublished letters billed as offering new insight into Norway’s greatest composer.” The letters involved Grieg’s lengthy correspondence with the pianomaker Karl Hals, with authors Erling Dahl Jr and Tønnes H Gundersen going into depth and studying a “difficult and turbulent period in the composer’s life.” They hope the book will “fill some holes” in the story about Edvard Grieg.